Defence and Security Equipment International (DSEI) is the world leading event that brings together the global defence and security sector to innovate and share knowledge. 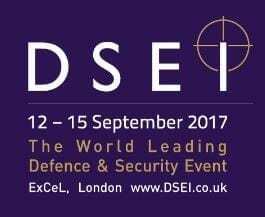 DESI will be held from 12 -15 September 2017 in ExCeL London. The show will have five key sector-focused Zones: Air, Land, Naval, Security & Joint, all showcasing the latest equipment and systems. You will find us at stand S4-460. We are looking forward to seeing you there.